Prince William competes in charity polo match, adorably chases 3-year-old cousin Mia Tindall: Pics! Prince William spent his Sunday horsing around on and off the polo field. RELATED: Prince William Looks Regal While Rehearsing for Trooping the Colour Parade – See the Pics! 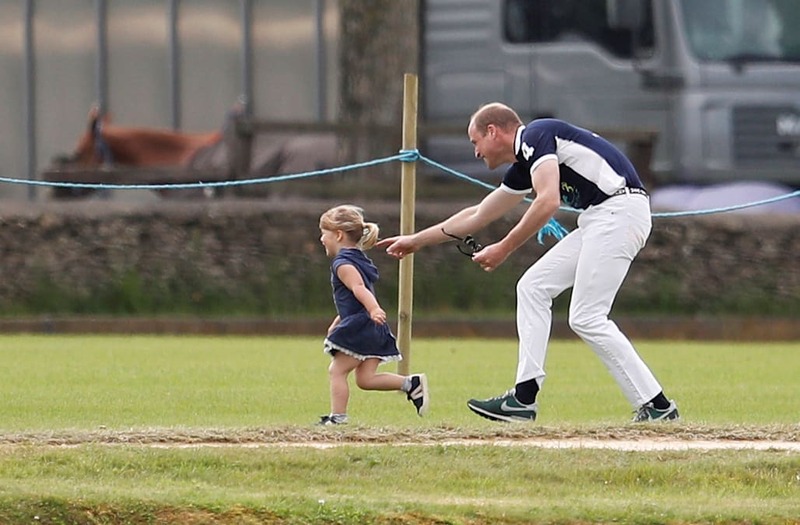 The Duke of Cambridge participated in the Maserati Royal Charity Polo Trophy at Beaufort Polo Club in Gloucestershire, England, where he was also spotted having some fun with his 3-year-old second cousin, Mia Grace Tindall. The benefit match helped raise funds and awareness for two charities that William supports as Patron: Child Bereavement UK and Fields in Trust. During breaks from playing in the match, the 34-year-old royal was seen goofing off with the kids and chasing little Mia around the field. Mia, daughter of Zara and Mike Tindall, is Queen Elizabeth II's great-granddaughter and granddaughter of Princess Anne. The day before, Prince William was seen taking part in the Colonel's Review -- the rehearsal for Trooping the Colour -- which is the ceremonial event marking the official birthday of Queen Elizabeth II.